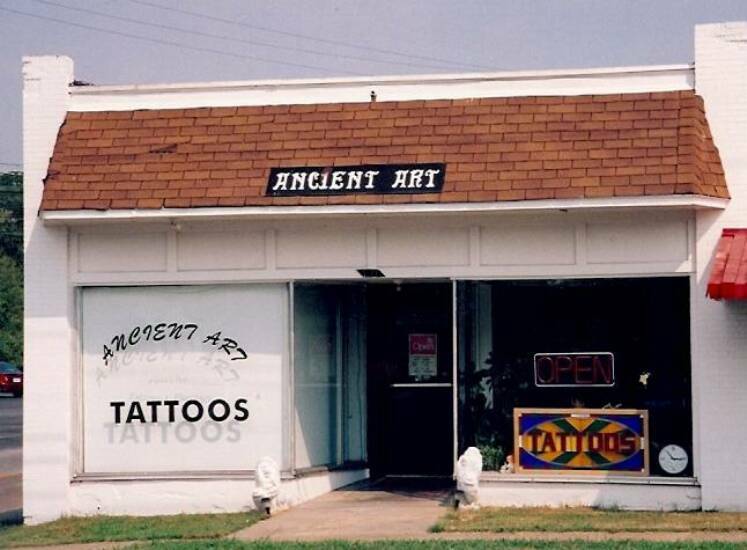 WELCOME TO ANCIENT ART TATTOO & BODY PIERCING STUDIO. WE HAVE THE BEST PRICES ON TATTOOING & PIERCINGS FOR THE SIMPLE REASON THAT OUR SHOP IS PAID FOR. WE DO NOT HAVE THE HIGH OVERHEAD OF PAYING RENT TO ANYONE. TATTOOIST & PIERCER MR. DOMO 49 YEARS EXP. TATTOO ARTIST PSYCHO 35 YEARS EXP. TATTOO ARTIST MS, SHAWNA 13 YEARS EXP. MS. TAMI 35 YEARS EXP. 132 YEARS OF COMBIND EXP. WITH NO INTENTIONS OF EVER MOVING. OUR ARTIST ARE MORE THAN CAPABLE OF DOING YOUR TATTOO OR WE CAN CUSTOM DRAW YOUR IDEALS. WE WILL WORK WITH YOU AS MUCH AS POSSIBLE TO STAY WITHIN YOUR PRICE RANGE. WE USE FANCY BODY JEWELRY FOR OUR PIERCINGS. THE SAME TYPE STEEL USED IN HIP REPLACEMENTS. WE ARE AN OLD SCHOOL TATTOO SHOP WITH A MODERN TWIST BY OFFERING YOU ALL THE MODERN DESIGNS ALONE SIDE THE CLASSIC ED HARDY DESIGNS SEEN EVERYWHERE THESE DAYS. BY OFFERING A LARGE DISCOUNT ON TATTOOING. YOU MUST BE 18 YEARS OLD WITH A REAL LIVE STATE ISSUED PHOTO I.D. FOR BODY PIERCING YOU MUST BE AT LEAST 13 YEARS OLD AND HAVE YOUR PARENT OR GUARDIAN PRESENT WITH THEIR PHOTO I.D. IF YOU WANT TO LOOK OVER SOME OF THE TATTOOS THAT HAVE BEEN DONE BY THE ARTIST IN OUR SHOP JUST GO BACK TO THE MAIN PAGE AND CLICK ON THE ICON THAT HAS THE NAMES OF OUR ARTIST. THANK YOU AND WE LOOK FORWARD TO SERVING YOUR TATTOOING & PIERCING NEEDS. UNION CITY, TENN. HENDERSON, TENN.